Somebody must be able to tell us more about H.E. Bucklin aka Bucklen. 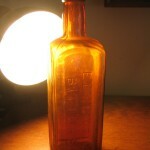 He had bottles of patent medicine widely distributed in the United States that bore the name of his company. 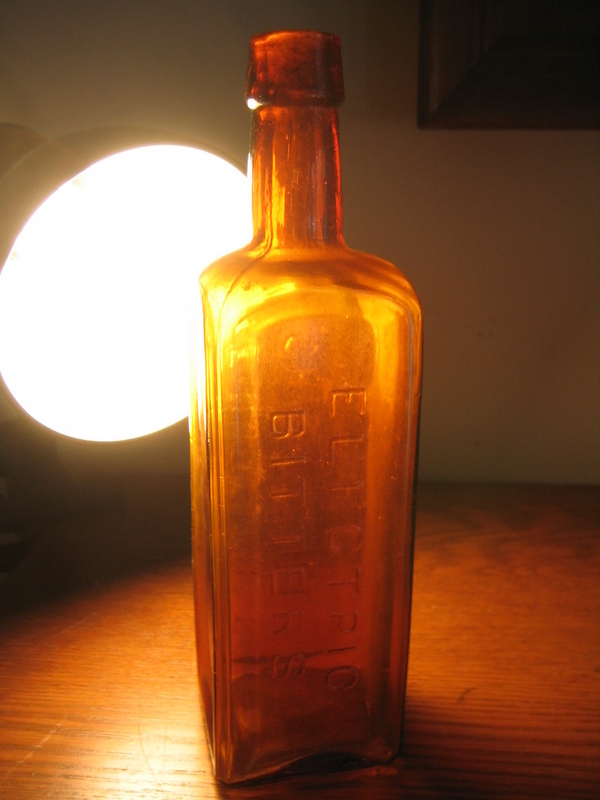 The fact that thousands of the bottles of this patent medicine still exist bears witness to the scope of his sales. Here the label of one of Bucklen’s bottles kept in the Smithsonian National Museum of Natural History. The product was sold for “temporary constipation and biliousness.” It contained the serious sounding ingredients of: Cascara, Podophyllin, Aloin, Strychnine Sulphate, and Capsicum Maker(s). The library at the University of Florida has a copy of the H.E. Bucklen Almanacs for years of 1909, 1910, 1912, 1913, and 1914. The almanacs for 1909 through 1913 say Chicago for the place of business of the company, but the 1914 says St Louis, which gives us a good indication of when the Company relocated to St Louis. Click to enlarge Photograph. If not a good laxative, the bitters had the potential to be an aromatic liquor. H.E. Bucklen & Company of Chicago were highly successful sellers of a number of well-known brands. Herbert E. Bucklen had purchased the rights to his medicines from one Dr. Z.L. King of Elkhart, Indiana, about 1878 and moved the business from Elkhart to Chicago about 1878-1879. 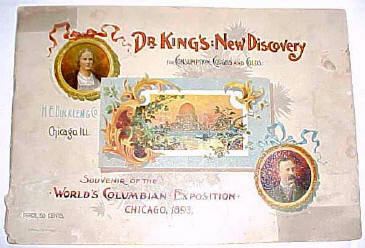 Bucklen spent lavish sums on advertising in all types of media, and created the brand name of “New Discovery”, which had national recognition by 1885. He also had several other top selling medicines including the Electric Bitters, mentioned above, and The New Life Pills, introduced in 1880 as a cure for stomach ailments. Products which never sold well were Dr. King’s California Golden Compound, Dr. King’s Hop Cordial, and Dr. Scheeler’s Great German Cure for Consumption. Bucklen’s “New Discovery” was a medicine for consumption (tuberculosis) a disease which at the time was killing millions of people. Many companies offered cures and remedies for consumption — all were frauds, including the “New Discovery”. “It is proclaimed to be the ‘only sure cure for consumption’. Further announcement is made that ‘it strikes terror to the doctors’. As it is a morphine and chloroform mixture, ‘Dr. King’s New discovery for Consumption’ is well calculated to strike terror to the doctors or to any other class or profession, except, perhaps, the undertakers. It is a pretty diabolical concoction to give to anyone, and particularly to a consumptive. The chloroform temporarily allays the cough, thereby checking Nature’s effort to throw off the dead matter from the lungs. The opium drugs the patient into a deceived cheerfulness. The combination is admirably designed to shorten the life of any consumptive who takes it steadily”. By 1893, the business was well enough established be a major retailer through sites at the World’s Fair in Chicago. This retailing accomplishment was achieved in part by offering for 50 cents a 31 page book, half filled with color lithographs of the world fair buildings, and the other half descriptive text. The advertising contained therein, of the “New Discovery” made sure that most people who went to the World’s Fair to see the marvels available to them at the end of the 19th century thought of the “New Discovery” as one of those marvels.